Antikythira passenger and car ferry ticket prices, timetables, ticket reservations and information for ferries sailing from Antikythira to Gytheion, Kissamos, Kythira and Piraeus. Compare all available Antikythira ferry ticket prices in real time and book the cheapest available Antikythira car and passenger ferry tickets sailing to and from Antikythira, Gytheion, Kissamos, Kythira and Piraeus with LANE Sea Lines ferries online with instant confirmation. Book Antikythira Ferry Tickets with LANE Sea Lines for ferries sailing from Antikythira to Gytheion, Kissamos, Kythira and Piraeus online in advance to enjoy the cheapest available ferry ticket price. The price you see is the price you pay. There are no hidden extras or surprises such as added fuel surcharges or booking fees and we do not charge you anything extra for paying with a Visa Electron card. The price we quote you for your selected Antikythira passenger or car ferry ticket, onboard accommodation and vehicle type is all you will pay, and that's a promise. To obtain a Antikythira ferry ticket price and book your ferry ticket securely online please use the real time ferry booking form on the left. You are also able to add a hotel at your destination, or anywhere else, to your ferry ticket when completing your ferry ticket reservation. Kythira Antikythira island: Antikythira is a very small island which is located to the southeast of Kythira and belongs to the Ionian Islands. This tiny island has a long history, although today it is declining. Antikythira has only 110 inhabitants that live permanently on the island and most of them are elderly. In summer, the village gets livelier with tourists or immigrants that come on the island, but still this number doesn't overpass 300 or 400 people. A land mass of 20 sq. km. Its coastline is 24 km. This remote island has no beach. The capital is Potamos. It's not just the capital, its the only settlement. By Potamos, ancient Aigilai has walls that date back to the 5th Century BC. Traces of Minoan settlements have been found on the island and generally its connection to Crete is strong all over the history of Antikythira. Since 300 B.C, the island had been continuously affected by pirate attacks, which destroyed the island many times. The island was re-inhabited in the Roman Era and, in 1204 A.D, the Venetians took over Antikythira and built a small garrison there to control the naval passage from the West to the East. The island soon became a refuge for Greek Revolutionists from Crete and the Peloponnese, who were fighting against the Ottomans. After the fall of the Venetian democracy in 1797, Antikythira was left unattended without having a government. In 1815, it was added to English sovereignty. In 1864, along with the other Ionian Islands, Antikythira became part of Greece. During the Second World War, the island was controlled first by the Italians and then by the Germans. After the Greek Civil War and till 1964, the island received political exiles, mainly communists. In the 1960s and 1970s, most of its inhabitants moved to Australia and America in search for a better life, but still keep strong relations with their homeland. The development of the island started in the 1980s, where electricity was installed on the island and water storages were built. At the end of the 1990s, the harbour was expanded and a small shelter for the fishing boats was constructed. The roads are paved now and a heliport serves the emerge situations of the inhabitants. Today, Antikythira bases its economy on fishing. Tourism is not developed yet and only a few rooms to rent can be found. The most important settlement is Potamos, where you can also find a policeman and a doctor. All around the island, you will find nice, small beaches to swim, such as Xeropotamos beach, close to which there lies the ancient fortified town of Kastro and the remains of the temple of Apollo. The most known festival on Antikythira is the name day of Agios Myronas, on August 17th, which is the patron saint of the island. This time Antikythira is at its peak and many pilgrims come. This small island can be accessed by boat from Kythira in 2 hours, Gythion in the opposite coast of Laconia in 5 hours or Kastelli, Crete in 4 hours. This tiny island has one telephone, one school with 6 pupils, one doctor, one police officer, and a monastery. There is a Kafenion and a Taverna but no post office or bank. There are 10 rooms available for tourists. Running water and toilets are scarce. Food is limited here, but available. This is not an island for tourists seeking anything but isolation. Best Price Guarantee - We always offer you our lowest available LANE Sea Lines passenger and car ferries ticket price to and from Antikythira. There are no hidden extras or surprises such as added fuel surcharges or booking fees and we also we do not charge you anything extra for paying with a Visa Electron card. The price we quote for your selected Antikythira ferry ticket, onboard accommodation and vehicle type is all you will pay, and that's a promise! In the unlikely event you find the same all inclusive Antikythira ferry ticket cheaper in the brochure of any other tour operator we promise that we will do our best to beat that price or offer you the choice of requesting a refund. 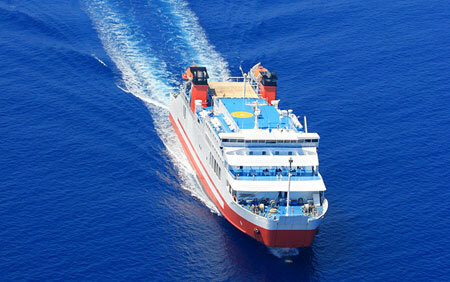 To book Antikythira car and passenger ferry tickets please click here. At ferryto.co.uk you are able to obtain live Antikythira ferry ticket prices, check availability and book car and passenger ferry tickets to and from Antikythira at our lowest available ticket price. Ferryto.co.uk is part of the world's largest online ferry ticket distribution network providing the ability to book over 80 major European ferry operators including to Antikythira and to over 1,200 other ferry routes throughout the UK, France, Spain, Ireland, Holland, Eastern Europe, the Mediterranean, the Baltic and North Africa.